Now for the truly important issue from my trip to Madrid: What did I knit? 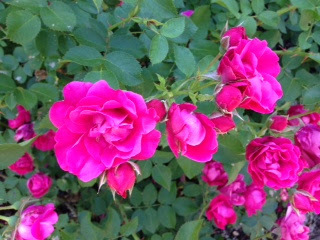 These are a present for my friend Debbie, who has a birthday tomorrow. Unfortunately she had to fly to the East Coast for a funeral, so I won't be able to give these to her on the actual day. 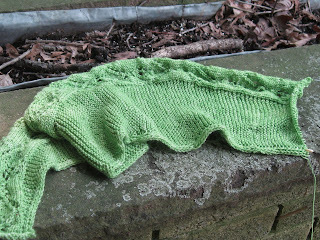 The pattern is Spring Forward, free on Knitty. It is a great travel pattern because it's simple enough to memorize but not boring. I'm sure I'll make it again. The yarn is a mystery skein from my stash. I have no idea what it is or where it came from. It definitely is a high-quality merino sock yarn. It rates high on the squishy scale. I should have got more knitting done on my trip, but I kept making mistakes and ending up spending as much time tinking as I did knitting! 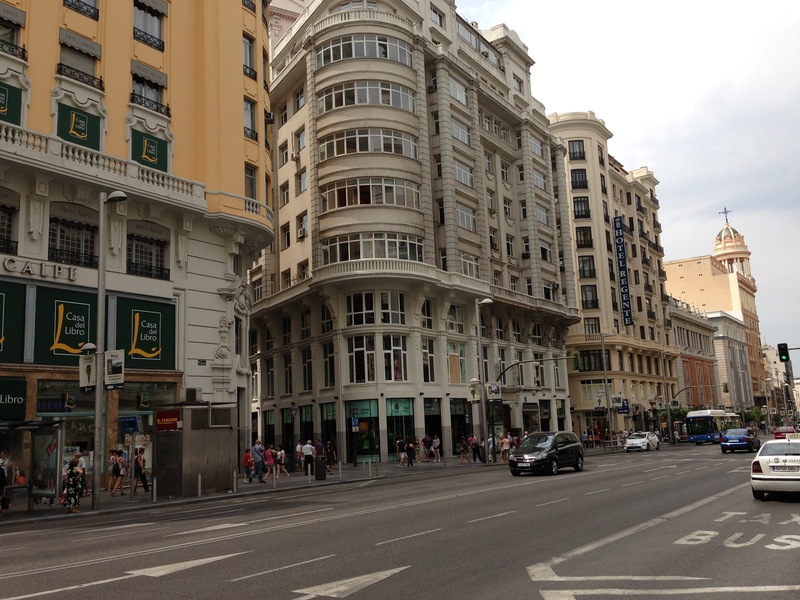 In other words, I loved Madrid. It is different from the other European capitals I've visited: more laid back, less crowded, very easy to sight see or just hang out. 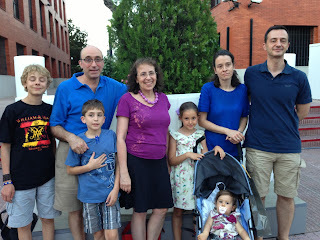 I hate it when people make you look at all 300 of their vacation photos, so I'll just share a few pics from my trip. 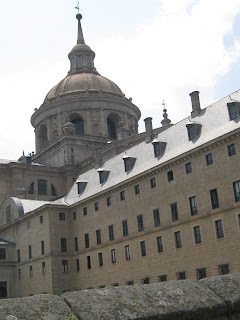 We took a day trip to the Royal Seat of San Lorenzo de El Escorial, a palace and monastery in the town of San Lorenzo de El Escorial, about 45 km northwest of Madrid. It's plain exterior belies the rich beauty within. 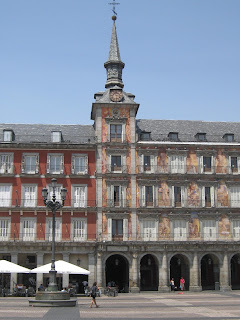 You could not find a better city for visiting art museums than Madrid. 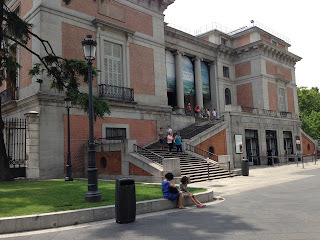 The Prado, pictured below, has a stunning collection, including works by Spanish masters Velazquez and Goya. 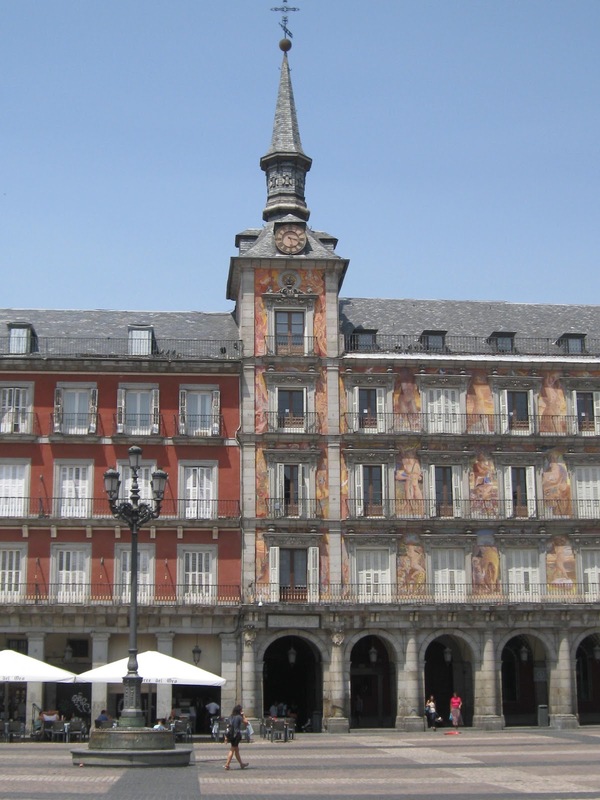 Spain once ruled Flanders, so there is a stunning selection by Hieronymus Bosch and Rubens. 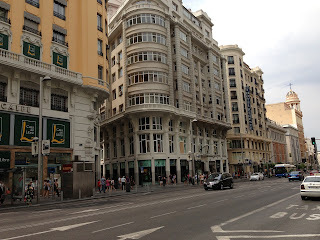 I could have spent days there, but had to make time to see see Picasso's Guernica, his anti-war mural at the Reina Sofia and the eclectic but fascinating collection at the Museo Thyssen Bornemisza. Of course, the best things about any travels are the people. 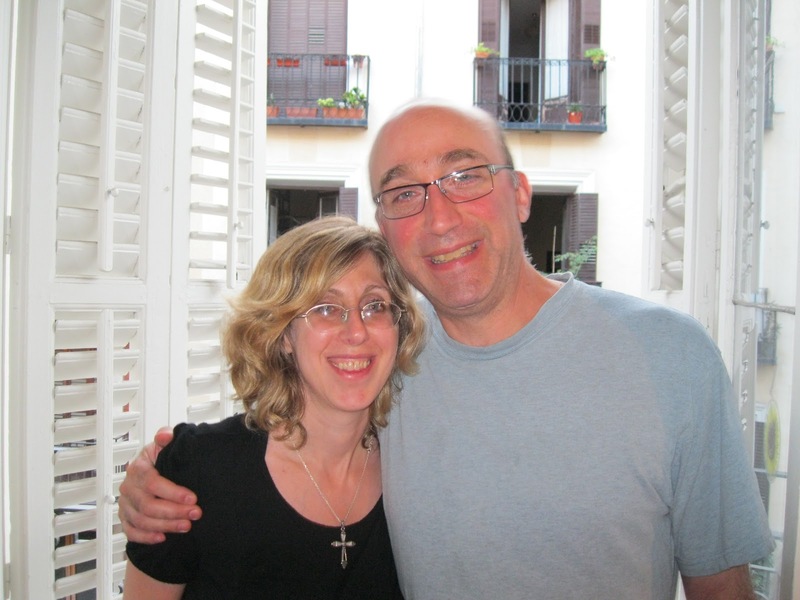 I owe thanks for this trip to my brother Eric and his girlfriend Nancy. 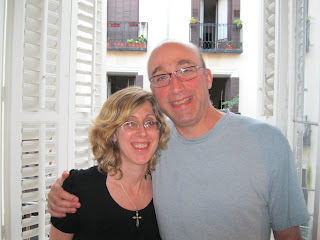 Nancy was teaching in Madrid for the month of July and they graciously shared their apartment with me. I had so much fun hanging out with them. I was lucky to have these two companions. Robbie, on the left, is Nancy's son. Theo is my nephew. They are both fun to be with. And very patient. They didn't complain when I wanted to check out some boutiques! Nancy's friend Ruchi, who she met when she lived The Hague joined us for a few days. She cooked us some amazing meals from her native India. Ruchi's son, Rudy, is Robbie's age. 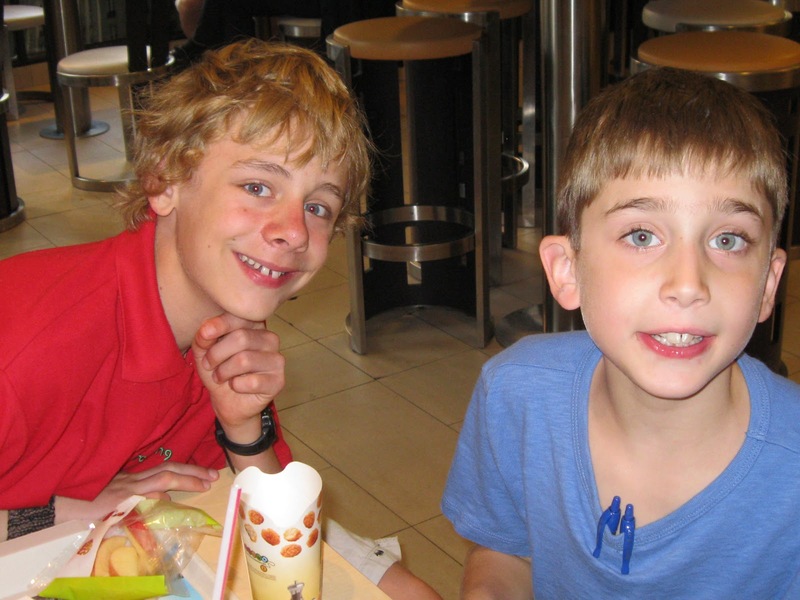 They met in school many years ago in The Hague. 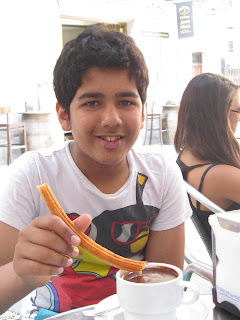 He's eating (well, we were all eating) Churros con Chocolate, a Madrid favorite. 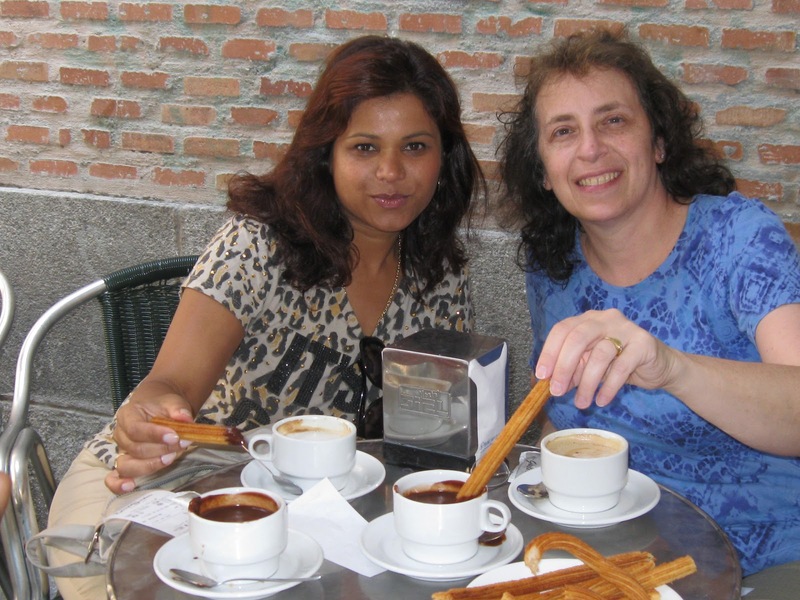 I'm not sure that you could find anything more delicious and less healthy: The chocolate is thick, rich and pudding-like, and the churros are light and crisp, due to being deep fried! 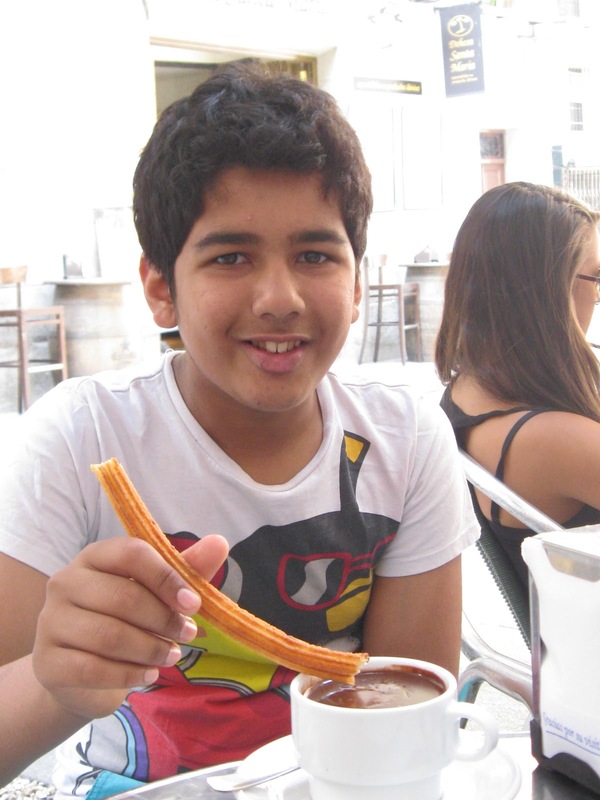 You dip the churro into the chocolate and enjoy! This was my first trip to Europe since 1986. Why did I wait so long? I'd forgotten how exhilarating it is to visit a place that is so different from the States. For a good laugh, follow this link. 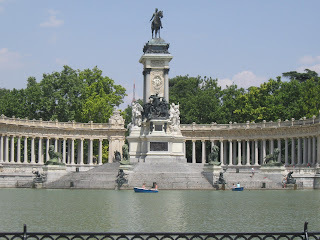 I'm heading off to Madrid for about two weeks. I'm hoping I'll have access to a computer so I can read your posts, but I don't think I'll be blogging! Is this not the cutest thing you have ever seen? It is Sven, a pattern by Carol Anderson of Cottage Creations. I can't take credit for this adorable gnome. 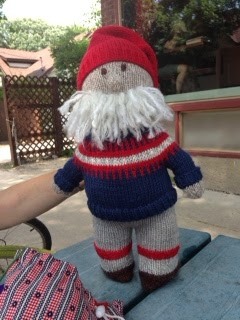 He was knit and stuffed by my friend Marsha. It's for one of Marsha's (grown) daughters, who likes gnomes. I think Cottage Creations is a Wisconsin company, but I can't tell for sure. Their web site is pretty skimpy. However, their patterns are supposed to be pretty good. This is the same company that puts out the Wonderful Wallaby, which is a very popular pattern. Marsha is such a good knitter. She makes sweaters that fit really well! I can't think of a higher achievement for a knitter! 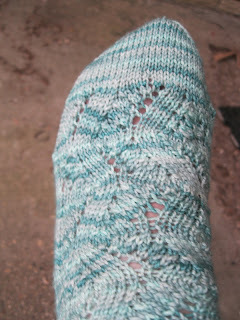 I just started this sock with Regia Nautica. It has looked a felt to me like a sport weight, but it's sold in the sock section of my LYS and I couldn't interpret the diagram on the ball band because it's teeny tiny and uses cm, not stitches or inches. 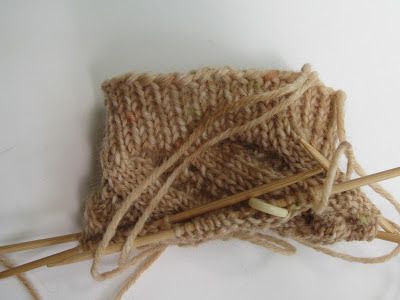 Anyway, I just looked it up on Ravelry and it is a sport-weight! That would explain why the first socks I knit with it are so thick! I do like it. The colors are gorgeous and the tweediness is very rustic and pretty. It is splitty, though, I would not use it on anything that would require much frogging. 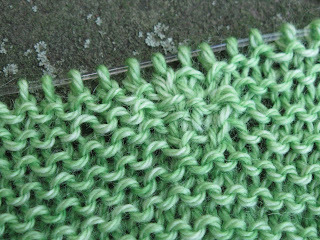 The pattern is Spring Forward from Knitty. 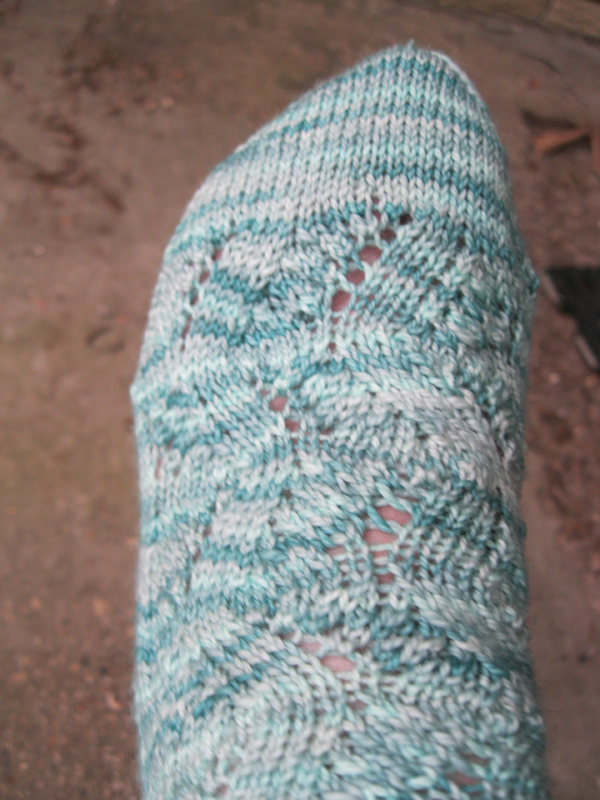 It's an odd choice, now that I know I'm knitting a winter sock, but it is really pretty. Teaser: I have an FO for Friday made out of the same yarn. Sometimes, for no reason at all, I just feel like learning something new. There is something addictive about acquiring new skills, isn't there? I find this applies to knitting as well as jewelry. 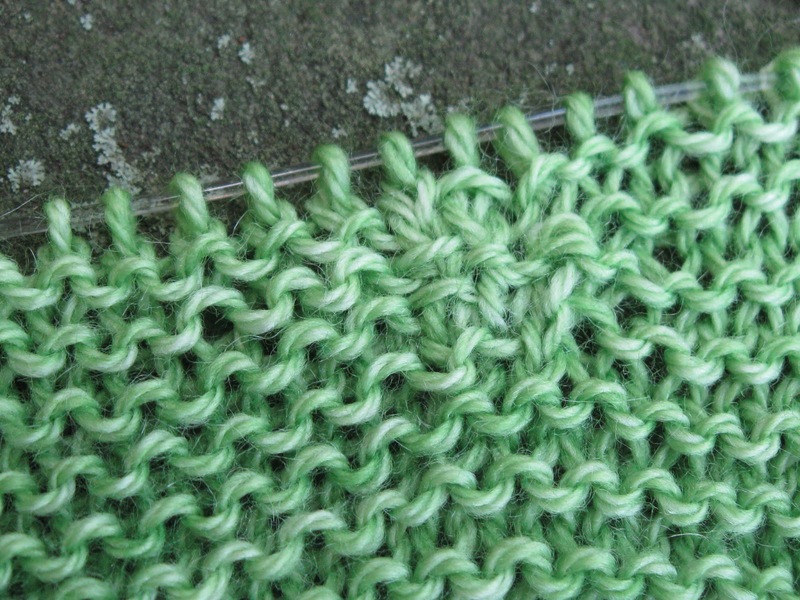 One of these days, I am going to figure out brioche stitch! 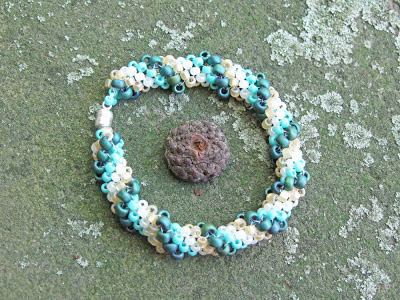 Yesterday I decided it was time to learn spiral peyote stitch. I pulled a book off my shelf and quickly found directions. 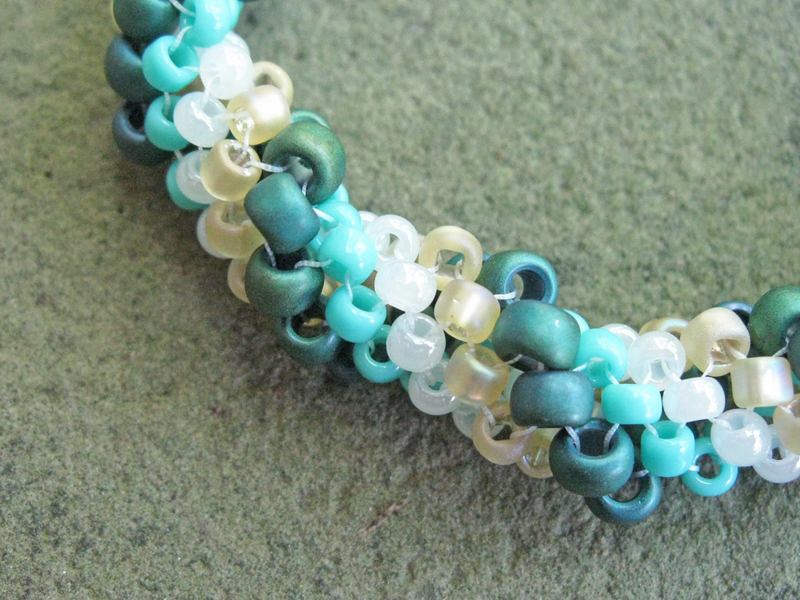 It's truly not a hard stitch, if you have mastered the basic peyote stitch. As you can see, the tension is a little loose, but I think that's a good thing. Tightly woven spiral peyote is extremely stiff. I don't think it would bend enough to be a necklace. Over all, my Garland Shawl is coming along beautifully. However, somehow, in the middle of a super-easy garter stitch, I made a big mistake. I thought about frogging and reknitting, but I just couldn't bring myself to do that. 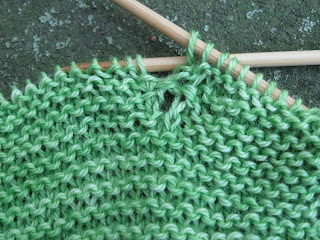 Instead, I decided it was time for me to learn how to knit to the point of the problem and fix it with a crochet hook. 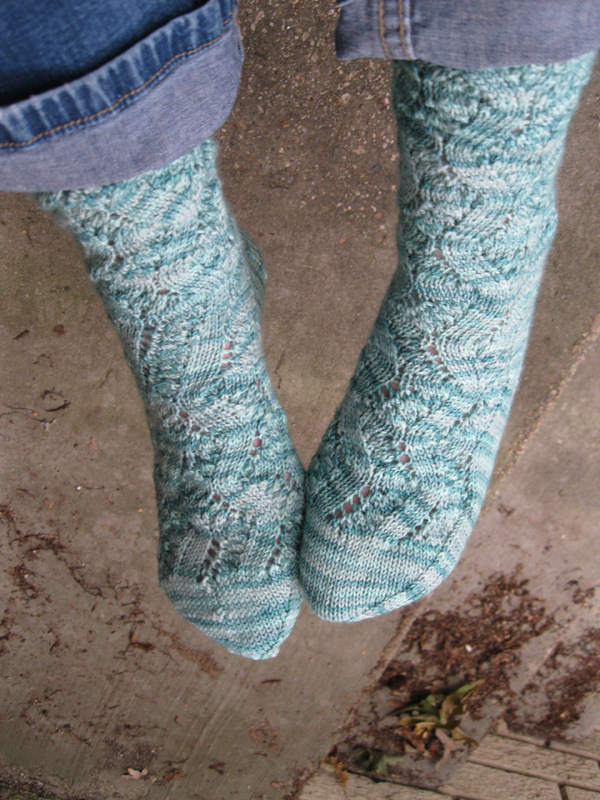 If this were a gift, I would have ripped back and reknit. But I know that I want to keep this and I decided I could live with this sloppy fix. Does anyone else choose to live with visible errors? The Potato Chip of Pets? Apparently the llama is the "Potato Chip of Pets." Who knew? I certainly didn't until I stumbled across this article in the New York Times. Owners say you can't start with just one because they are very social animals, so you have to get two or three. Like potato chips, you can't have just one. The scary part is that you can start with three and end up with dozens. 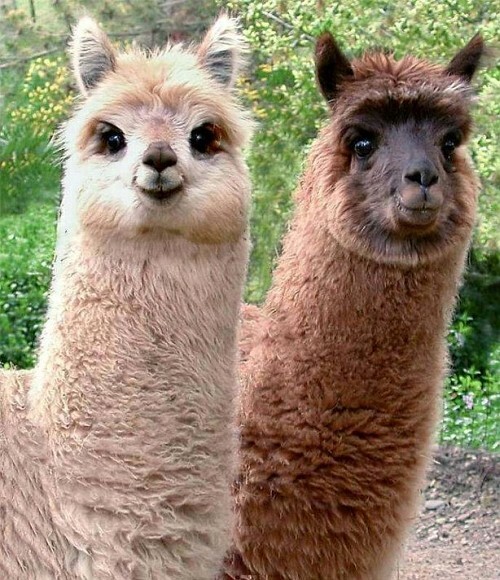 Llamas are fairly new to the States because foot-and-mouth disease kept them out for many years. But the Peruvian animals are here now and number 115,000. That's about the same number as alpacas -- but let's not go there. It seems that there is bad blood between owners of llamas and owners of alpacas. Owners say llamas have amazing eyes that make you feel that they understand all your troubles. Not being a huge animal person, I'm thinking that maintaining theses fairly large animals would involve a certain level of trouble. And expense. But, not to worry. They say that llama wool is as desirable as alpaca, so maybe they pay for themselves. However, I haven't seen llama yarn in any store. At least not yet. Have you? I admit it: I love Independence Day. I wait all year to hear a string of voices read the Declaration of Independence on National Public Radio. It's really an amazing document -- and short, too. I guess that makes me a history geek. Those are my feet and there is a shoe in each one! I have to admit that the cute shoes didn't last. I have to wear adjustable, athletic shoes because 1. The doctor said so; and 2. 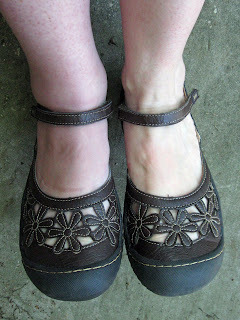 My right foot is still swollen (as you can see) and it doesn't fit comfortably in most of my shoes. The doctor also ordered me to do a minimum of walking for the rest of the month. I can't even go for a recreational walk! So, in a way, I have a little less independence. But that's OK -- as long as I'm healing! 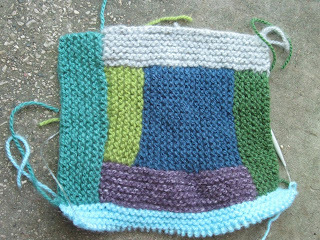 It is the beginning of a Moderne Baby Blanket, a freeform and fun design by the Mason-Dixon Knitting girls. 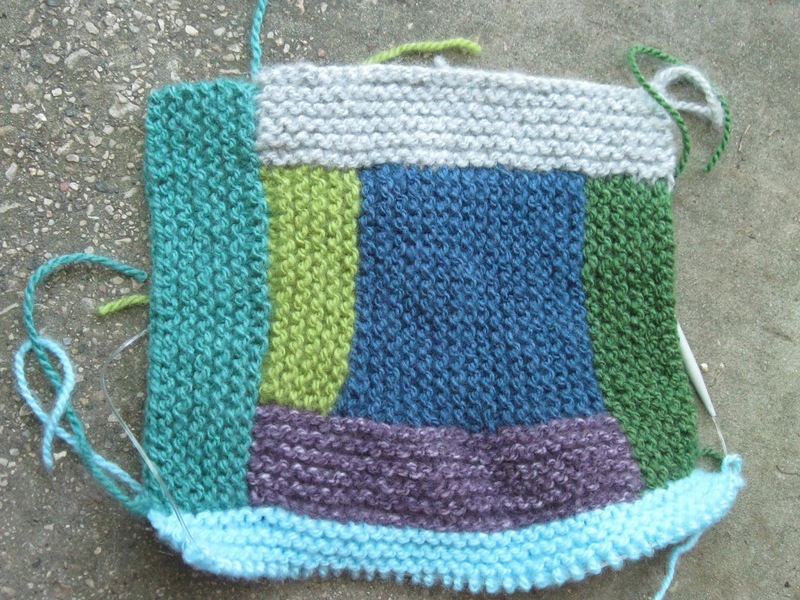 I am making this one out of Lion Brand Jiffy, a bulky alcrylic yarn. This baby is due in August, so I figure he will need a blank that you can toss on the ground and throw in the washing machine. It's a fun, mindless project. OK, I'm nowhere near old enough to retire, but I can't help but think about it in the summer, when I can spend tons of time on creative pursuits instead of rushing off to school each weekday. Also, a lot of my friends are older than me, and they are retiring. And yet, I do like my job. Yesterday I went to the courthouse to support a former student who had been charged with felony battery and possession of marijuana with intent to distribute. I adored this young man and just couldn't see him hurting anyone! Turns out, my instincts were right. He did not commit the battery and the court dropped that charge. I am so upset about the drug charge. This young man just graduated from high school -- which is a real victory. School is not his style! He's enrolled in a trade school. I told him I'd try to help him get through the criminal justice system. It is an honor to get know young people and to feel -- once in a while -- that you've actually helped someone. My days at school are hectic and intense, and I often feel that I'm treading water. It's easy to forget that I am lucky to be a part of a larger community.